Next iPhone to Offer HD Video Capture? New rumors are flying about the latest additions to iPhone OS 4.0, the latest iteration of the iPhone operating system scheduled for public release this summer. Based on the latest developer release, the upcoming OS will supposedly offer new features such as file sharing, orientation screen lock, new iPod controls, and a simplified method for killing apps running in the background. It also appears that Apple may have a few surprises up its sleeve regarding a new iPhone device, despite exhaustive reporting in April about the now-famous lost iPhone 4G. But remember: even though these features have been discovered in the latest developer release of iPhone OS 4.0, there's no guarantee yet that they will make it into the official release. The latest version of the iPhone OS 4.0 SDK suggests the next iPhone device may be able to record high-definition video, according to MacRumors. A new addition to the SDK's Image Capture framework may allow applications to capture video at 1280x720 resolution, also known as 720p high-def video. The latest beta of iPhone OS 4.0 will allow you to share files between your computer and your iPhone through the iTunes interface, according to Boy Genius Report. All you have to do is connect your handset to the computer, select your iPhone in the left hand column of iTunes under 'Devices,' click on the 'Apps' tab and scroll down to 'File Sharing.' Right now it appears this feature is only for sharing files with your iPhone's Mail application. It's also not clear if this feature will make it into the final version of iPhone OS 4.0, because at the time of this writing, only Boy Genius Report was making references to the new file sharing feature. The latest beta release allows you to lock the screen orientation so that the iPhone screen won't switch between landscape and portrait mode. Sitting alongside the new orientation lock will be a set of regular iPod controls including play/pause, move forward, move back, and an iPod application icon. There seems to be some disagreement about how you access the new controls. 9-to-5 Mac and Macstories are reporting that you flick the homescreen to the left from your first page of applications, similar to how you access spotlight right now. But Boy Genius Report says you have to double tap on the home screen, which brings up Apple's multitasking dock, and then swipe to the left. 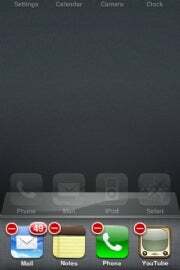 The multitasking dock in iPhone OS 4.0 allows you to kill apps running in the background. Orientation lock is a great feature for stopping the iPhone's highly responsive accelerometer from shifting the screen view every time you change position when lying in bed or on the couch. Some iPhone apps, like Amazon's Kindle for iPhone, already offer a screen lock feature. But unlike the Kindle app, the iPhone's native orientation lock will only lock in portrait, and not landscape, view. However, since this is just a developer release, it's possible Apple could add landscape orientation lock in upcoming releases. To kill apps running in the background in the new iPhone OS 4.0, all you have to do is call up the multitasking dock, press and hold one of the apps running in the background until a delete button appears next to each application icon. Then you just select all the apps you want to terminate. Previously, in iPhone OS 4.0 you had to call up the multitasking dock, press and hold an application to trigger the kill switch and repeat the press and hold for every app you wanted to terminate. The press and hold method is similar to how you move or delete iPhone apps in the current iPhone OS. So what do you think iPhone owners? Any of the new rumored features strike your fancy?